I am so entranced by the twisting lock and the pin locks on those last two pictures. Aren’t they amazing?! 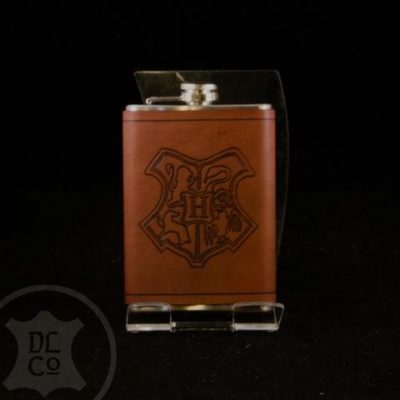 I can personally attest to the effective holding power of their flasks as well. If you would like to view their other wares, they can be found on their website, Facebook, Instagram, Twitter, and Pinterest. See you next week with a new tutorial! Dying things can be a long and expensive process sometimes. Not to mention all the steps you have to go through to prepare it so that it’ll stay. Thankfully, the internet has come to our rescue once more! 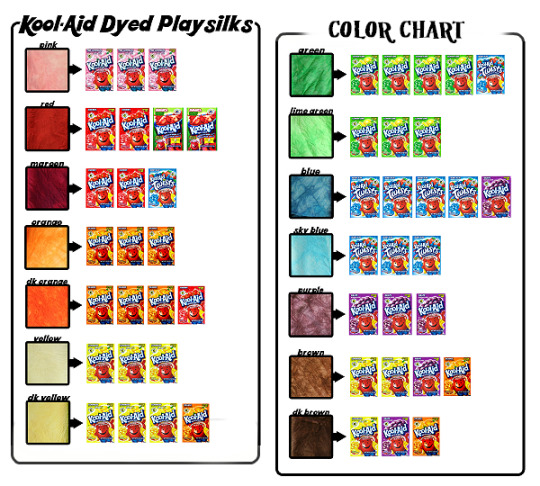 Today I’ll be sharing the secrets of using the cheap drink brand Kool-aid as your all purpose dye. It took the “dye” (undiluted) in about 3 seconds. After drying for about an hour and a half, it would not wash off in the hottest tap-water. It would not wash out after soaking for 30 minutes. Also, you’ll want to heat the dye water up, just like you would with commercial dyes. This helps stimulate the molecules and ‘activate’ the dye to help the color permeate. Once it’s set for 20-30mins, let it dry and then rise in cold water to remove the excess. 😀 Several people have even made charts to help others achieve desired colors! A quick google search gave me this one, but there are loads more, including yarn results which very much so appeal to me, lol. Simple, pretty, and ready to carry your needles! I love it’s cute whiskers! 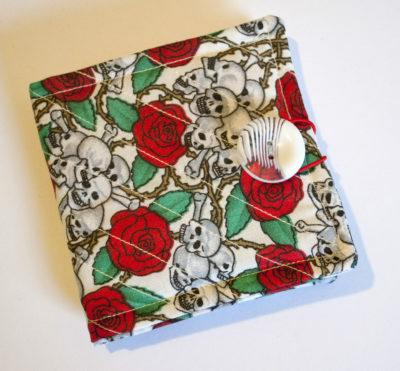 Plus a skull and roses needle book is super cool! All the way from Germany, no less! Keep your needles happy and they will always treat you right! 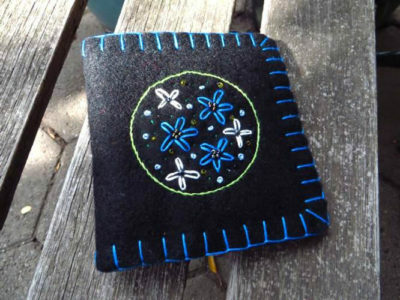 The felt pages of needle books not only serve to prevent accidental stabbings while rummaging around in a project bag but also help absorb leftover oil from your skin! 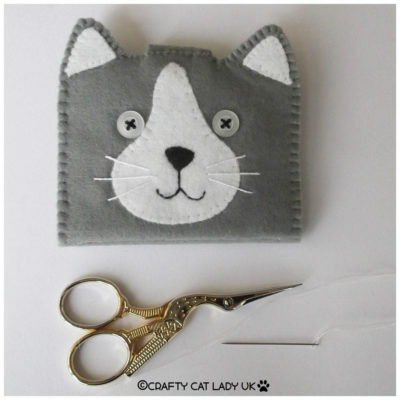 Next week we will look at a different type of needle case. 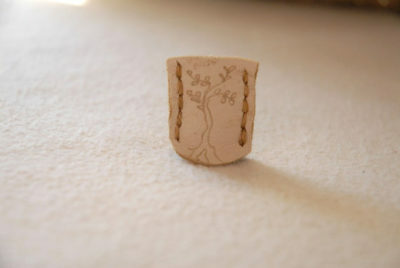 Very elvish looking with the pretty little tree! I mean, asking for a sloth thimble would be just perfect! 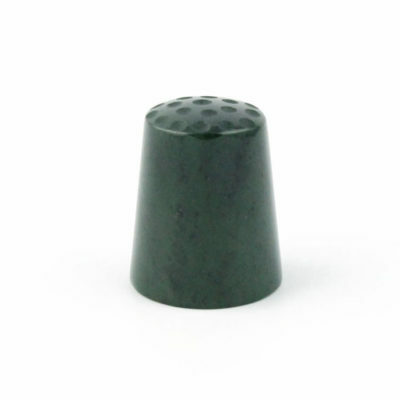 Jade is also said to enhance creativity. Though this one makes me want to bust out my blacklight like it’s the 90s again. I may give one of these a whirl someday when my Grandma’s gets a well deserved retirement. Next week, I think I will give my crochet tools some love, starting with some amazing yarn bowls! 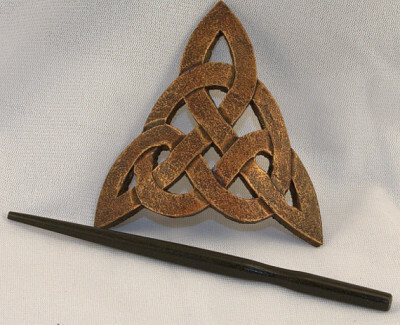 I’ve made my second trip to the local Renaissance Faire this weekend and purchased something I’m so very excited to use! 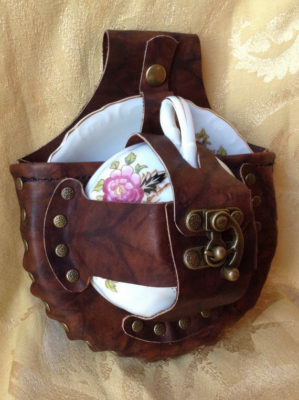 I will say that while I don’t have a full outfit as of yet, the Steampunk aesthetic has always fascinated me and so I found myself purchasing a teacup holster because one never knows when you are going to need a cup of tea. This is not exactly mine but very similar in idea and performance. 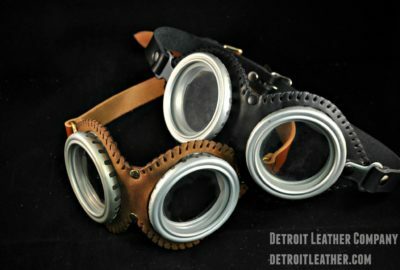 This got me to thinking, what other functional Steampunk accessories are available? 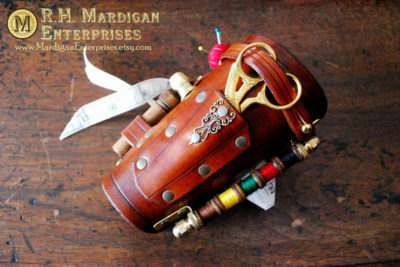 Anyone can slap some gears on a hat/necklace/bracer/belt and call it Steampunk but what about those things that actually…work? I’m kind of a sucker for stuff that not only looks good but serves a purpose as well. 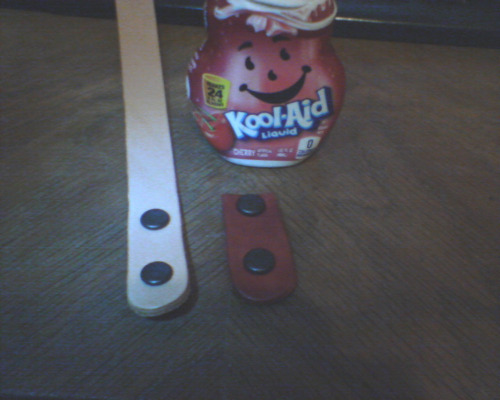 Here are a few more items I found that may someday find their way into my cosplay attire. 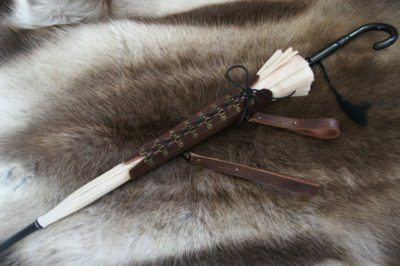 Could also hold a traditional umbrella for those unexpected showers! 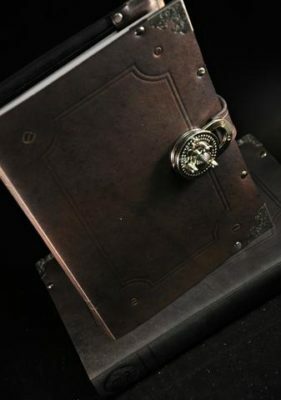 There is the possibility of an alchemist’s panel as well with more room for vials! My summer wandering days are coming to a close so I think upcoming Sunday posts may include more holiday prep, gift ideas, and settling in for colder weather. See you next week and stay crafty! Happy Sunday, all! While at Wizard World Philadelphia last week, I also had the good fortune to meet a wonderful leather worker. 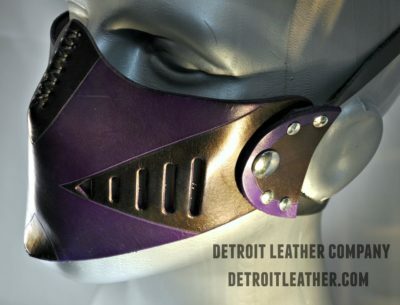 Steven is the owner and creator of all of the wonderful leather bits at Loot Maker. 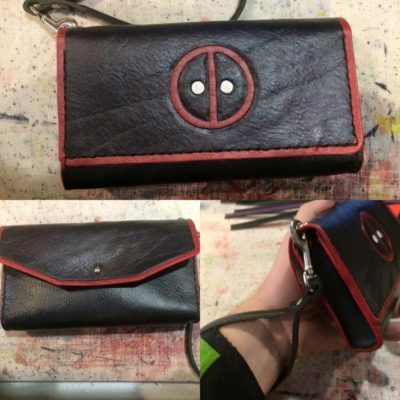 A stylish way to store money for chimichangas! 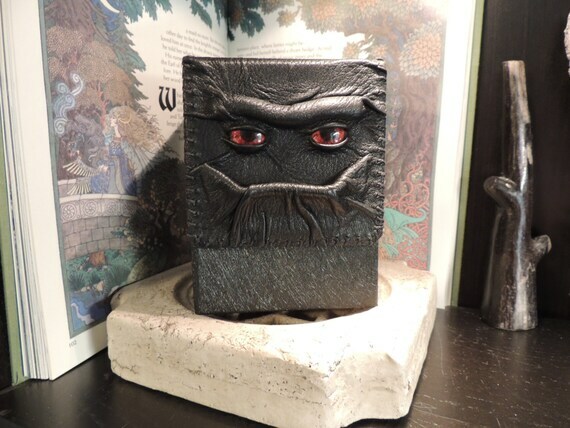 From purses to wallets to a wide array of leather coasters, there is all sorts of excellent loot to acquire! 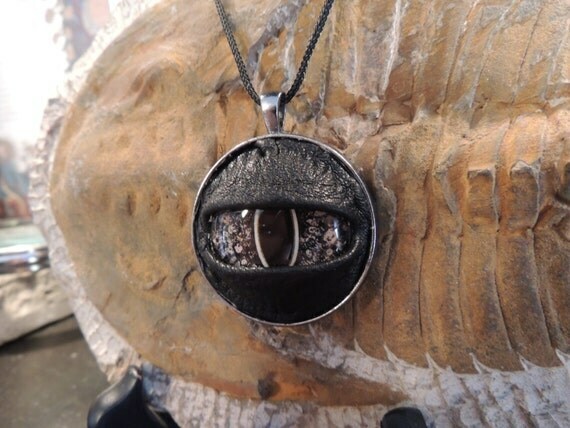 He has something for practically every fandom and if he doesn’t, there is always the possibility of a custom order. 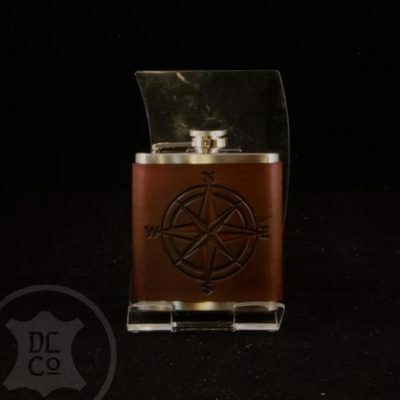 I must say that I was particularly attracted to the lovely flask sets. 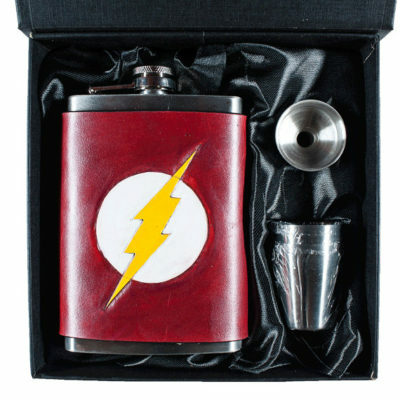 This will help you imbibe in a flash! 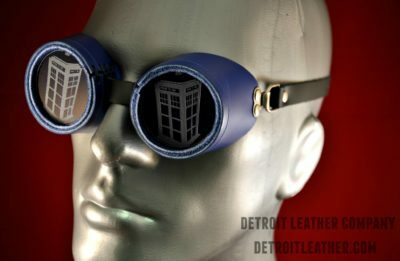 If you’d like a geeky leather fix or to set up a custom order, Loot Maker can be found on Facebook, Etsy, or their website. ch that’s a straight as possible, though you can be a little more industrial and use a pipe or a dowel. Any of these things you can spray paint any colour you’d like! 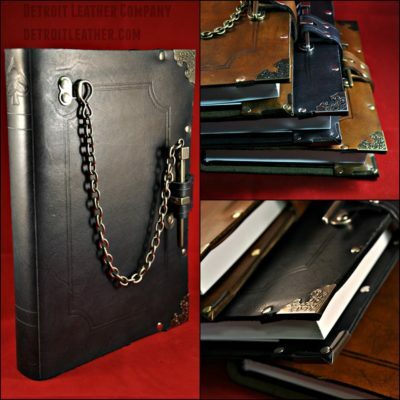 You’ll need 2 leather strips that are at least 40″ long which you can find here. 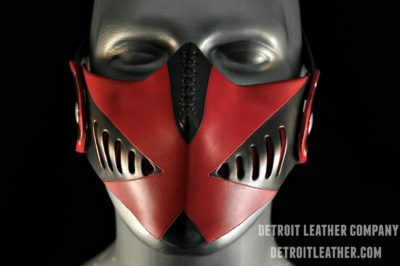 I would also check craft stores, and if you know any leatherworkers or beltmakers. 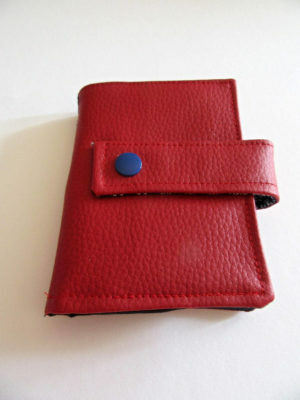 You will need a thin leather cord which can be found at most craft or dollar stores. You will need a 12″-24″ long roll of paper with a centre hold of at least 2″ in diamater – most craft paper rolls should have this. You will also need a hammer, 1″ nails, a couple clothespins (which you can paint if you’d like) and a wee ceramic pot with a hole in the side. You can find something like that at Ikea, or keep an eye open for any small basket that would work. You basically need something with a hole in it that you can tie to the branch. 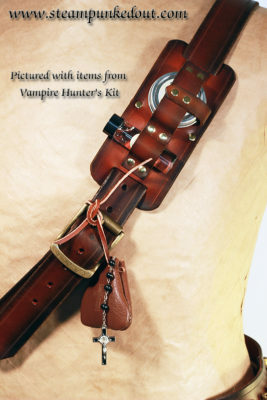 First you need to decide how long you’d like your leather strap to hang on the wall. 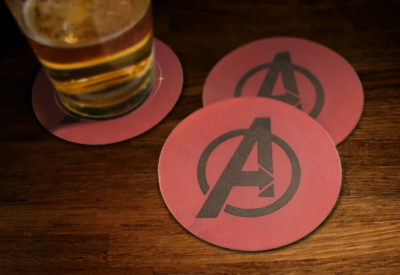 You will be folding them in half, but you can cut them as short as you’d like. Just keep both of them the same length. Second, you need to decide on the height you’d like your roll of paper to be at. Fold the first strip in half to form a loop, and hold the loop at the height you’d like the paper to be. Pinching the top ends of the leather strip together, hammer a nail through the ends where they meet on the wall. Before you nail the second loop to the wall, to make things easier, you should insert your paper roll onto the branch and then one side of the branch into your loop. You can use a friend or a level to decide where the second strip should be attached so that your roll of paper is level. If you’re using a branch that has some curvature, you may need to adjust the second strap so that the roll of paper hangs level. Nail the second strip to the wall, and if you’ve needed a different length, you can trim the excess. Take your length of leather cord and fold it in half. You can tuck the centre fold through the little hole in your hanging pot and pull the ends through the loop to secure it. Tie the cord to the branch in whatever fashion you’d like. The photo below shows a sleek method for this. Your last step is to use your clothespins on the edges of the roll of paper on both ends to weigh it down so as to keep the paper from rolling back up onto itself. And voila! You’ve got a really cool, super easy notepad that you can use for anything – grocery lists, messages, notes, whatever you need! Happy crafting! Have a wonderful weekend! Over the years, my hair has been many different lengths but I generally default to a longer style simply because it is the easiest to pull back out of my face. Because of this, I like to find embellished hair ties, bows, and barrettes. 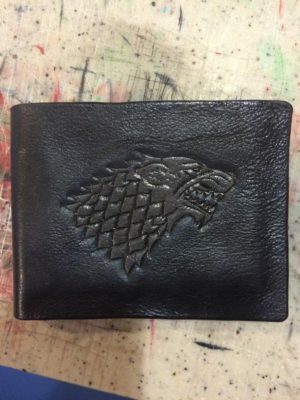 During the convention season this year I regret one major thing: not purchasing a leather barrette from Armoured Wolf Productions. These little beauties are so detailed and eye catching that I couldn’t help stopping at the booth just to take a closer look. A lovely knot to keep your hair free of knots. 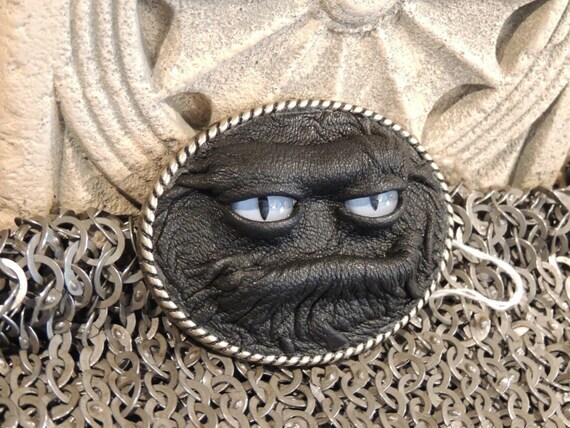 I’ve purchased similar hair accessories in the past but Armoured Wolf had some truly unique designs. Hair in your face? Nevermore. 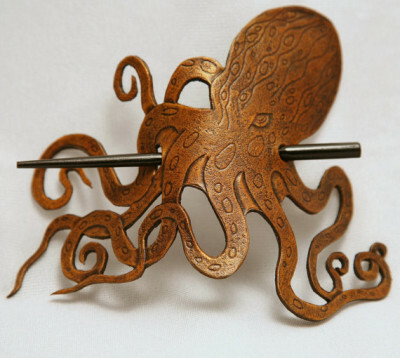 For the lengthy haired steampunk enthusiast in your life, tentacles and gears are always a good idea. 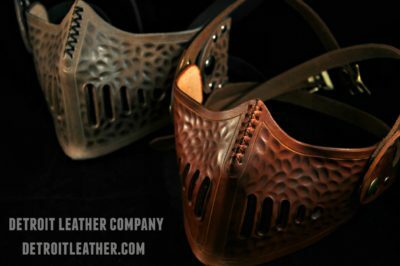 Besides unique hair tamers, Armoured Wolf Productions also creates beautiful leather pouches, bracers, and other excellent cosplay pieces. 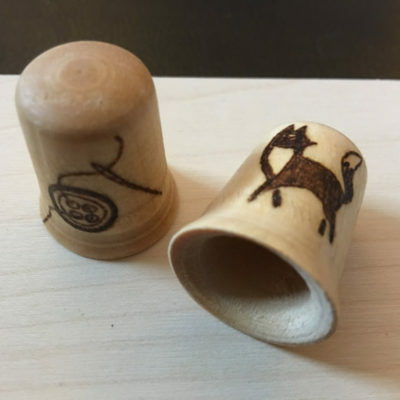 They can be found on Etsy or Facebook and I would suggest making a beeline to their shop to take advantage of their current holiday special coupon! Alright, I’m crossing my fingers with this one. This fabulous book maker has only just started posting their work and it shows quite a lot of skill so I’m hoping we will only see more of their style in the future. 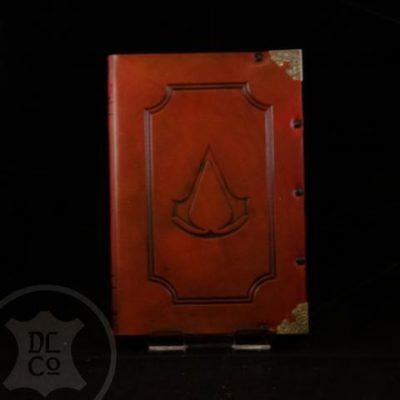 While there is not a lot of detail done on this book, everything that has been done was clearly carefully planed and pain painstakingly handmade. 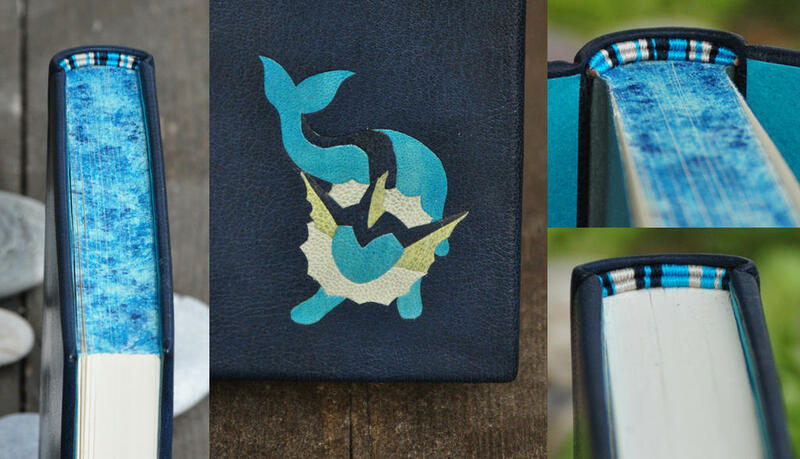 That adorable leather Vaporeon? I was made using onlay techniques meaning each strip of color is no more than .2mm thick and offers almost no noticeable raised texture to the cover; and yes, each color is it’s own strip. The rest of the details are just as subtle and beautiful. 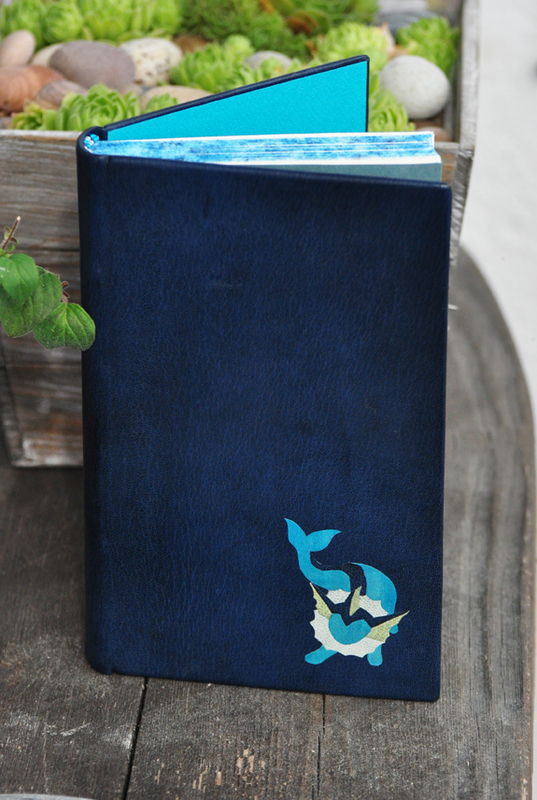 The end bands are hand sewn and the marbling on the top of the pages was created by compressing the book and then hand painting the effect on. Aqwell is an artist from Finland whose work definitely bears watching and if you’d like to see the other book she created you can find it on her deviant art account. The artist at Abbots Hollow Studios has quite the imagination, and wants you to join in on it! He is creating highly crafted pieces to add charisma to even the most basic outfit, and reminding us that we need not limit ourselves to department store selections! 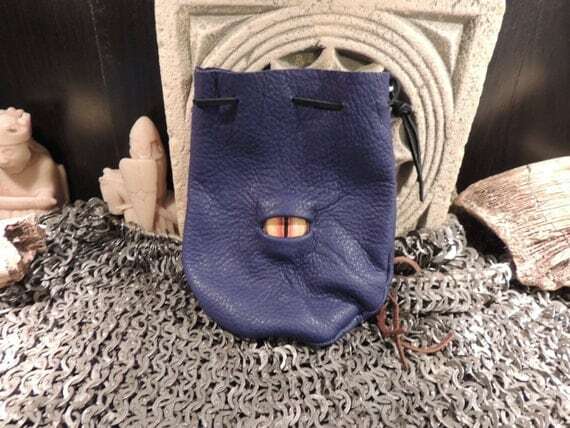 You can choose between a more demure looking pouch, or call upon the power of a dragon to watch over your possessions… be careful, though, as he may take it for his own. 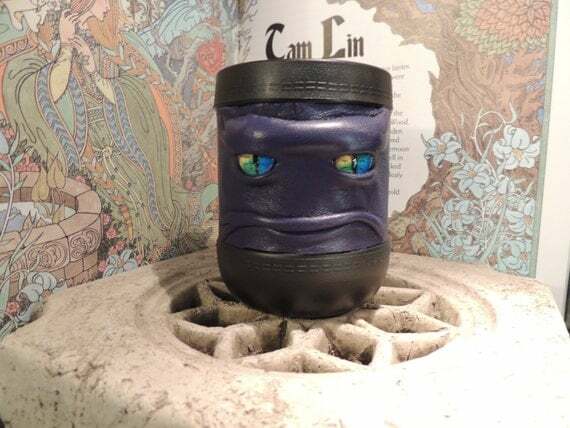 Need to add some personality to your card holders and dice cups? These’ll do the trick! More ways to enchant your everyday. 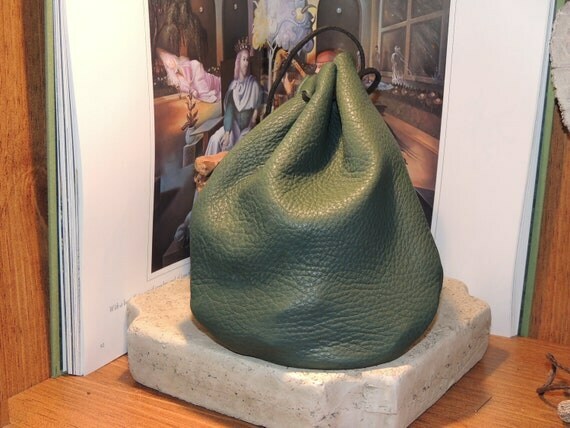 These pieces are amazingly crafted and designed and the leather looks to be of amazing quality. Abbots Hollow Studios is really us showing that you don’t need to be in a fantasy novel to experience the fantastical, all we have to do is see the possibilities… perhaps having an extra eye will help?